You have decided to become a part of the world of shopping online -- this time not as a consumer, but as a retailer. Before you can begin to build your online retail empire, there are a few things that you are going to have to do. One of the most important things that you have to do is set up an e-store. Today we are going to look at some of your best no-cost options for creating your own e-store. That way you can test the waters without having to make a large upfront investment. What is an E-store exactly? ◉ List items for sale in a catalog. ◉ Organize those items in some logical fashion and ideally perform searches on them as well. ◉ Allow shoppers to create a virtual cart so that they can select items to purchase. ◉ Allow users to register or identify themselves in some way so that they can receive their products. ◉ Allow end users to make payments that you can receive. This task, though, may be accomplished via a digital payment processor. So with this definition we can clearly rule out sites like PayPal and other online payment centers as e-stores. We can also rule out shopping comparison sites that give cost listings for multiple stores and merchandise catalogs for brick-and-mortar stores with no way to buy the product online. Now that we have talked a bit about what exactly an e-store is, we can look at why you might need one right now. Why would I need an e-store right now? There are any number of reasons why an e-store may be important for your needs right now. Let's take a look at some of the most common reasons. 1. You have a retail location and you want to expand your business without the cost of a new location. 2. You are starting a business and your model encompasses being able to sell online. 3. You have an existing blog or website with a fan base that might be willing to buy merchandise if you offered it. The extra stream of revenue and promotions would be a help. 4. You want to create items like T-shirts to promote a cause and raise awareness while getting some donations at the same time. Of course those reasons are only the tip of the iceberg. Who knows why you might need a store now? It doesn't matter, as long as you know why you need one. Now that we have gone over the basics, we can take a look at why choosing a free e-store host may, or may not, be right for your needs. 1. You can test out your merchandise in a no-cost form. Only the investment of a little of your time is needed to give e-retailing a try. 2. You won't have to hire a developer since freebie options will usually be set up with templates. 3. You will not have to buy a hosting package or upgrade your website to start the shop. 4. You will have a community of other e-retailers from which to get help. 5. Depending on your choice of sites, you may get help indexing your products or store in the search engine. Of course, for every good side there is a bad one. Before you make a decision you should be aware of those potential negatives. 1. You may be limited in the number of products that you can list. 2. You may have to limit your customers' shipping options. 3. You will lose a cut of each of your sales to the site that hosts your store. 4. You will have limited choices in customizing the look and feel of your e-store. 5. In most cases you will not be able to integrate your store into an existing website or blog. 6. If your store's host is hacked you could lose data, and you have no way of securing the site beyond those protections. Now you should have an idea as to whether a free service is right for you, or if you need to find a paid option. If, however, you are on the fence try this handy quiz. These questions are true/false. 1. I have a wide range of products that I want to sell to my customers. 2. The color and layout of my store are very important to me, and to my brand. 3. I want or need to be able to integrate my store into an existing site. If you answered true to any of those three statements, then the paid option would probably be best for you. If you gave three falses, then you are good to go with a free choice. Now that all of the preliminary are out of the way, we can look at your e-store options. These options will come in two varieties: any product and swag. The swag sites are designed to let you put logos and images onto items such as T-shirts, tote bags and mugs quickly and easily. An "any" site will let you list any products that you want, from soap to stuffed animals or antiques. Now that you understand the difference, we can look out some of your potential new retail partners. ◉ The ability to put the same image on multiple items easily. Well, a lot of your decision will be based on the features that you need. Some of it will be about feeling out the communities and deciding what you are best suited to. A solid community that you can interact with can help you to promote your wares. Just be aware that many of these sites are geared towards softlines. For those of you who have never worked in retail that means clothing, canvas bags, etc. and not hardware, home appliances etc. Before you make a decision, however, you may want to think about the future. By the future, I mean future expansion of your e-store. If you plan to grow in the months or years to come, then there are a few questions that you may want to ask yourself when choosing a free host. 1. Does this site allow me to upgrade? 2. What are the fees to upgrade my account? Is there a one-time fee? An annual fee? A monthly fee? Do these fees seem reasonable? 3. If I need to upgrade in the future will I be able to change the look of my site if I want to, or will I be stuck with the default? 4. If my upgrade plans involve expansion to integrate with my own domain, is this possible? Is it associated with an extra fee? 5. Does this site have a high level of paid accounts? (A low number may indicate a problem). Does the community think well of the site or are there many complaints? A note on using online stores with brick and mortar stores. This set of complementary practices can be easily integrated with a few tips. ◉ Be sure to include your e-store's URL on your marketing materials. ◉ Link to your shop from your main site to help customers find it easily. ◉ Use unique SEO on each site. Similar is okay, but identical is not. It will be seen as spamming by the search engines. ◉ If available, use widgets to showcase items on your main site. This is doubly important for sales events. ◉ Keep sales, prices and discounts consistent in both places, or customers who find out that they could have gotten a better price from you online will be upset. 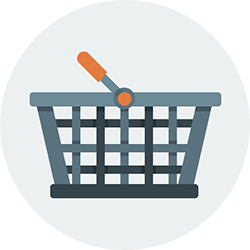 Since a shop that no one knows about is as useless as a screen door on a submarine, these tools can help you to promote your sweet new e-store to the masses. SEO tools is a site that can help you choose your keywords. Twitter can help you attract people with links. Facebook lets you give more detailed information and get interaction with your clients. Of course, there is a wide variety of tools that you can find online. Feel free to look around and see what you are happy with, and which methods you want to pass on by. Now that you have chosen a site and learned how to promote it, all that is left to do is to wish you the best of luck with your new shop.